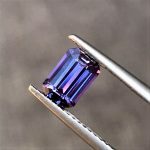 1.25ct Purplish Violet – Emerald Cut – Ceylon Sapphire. Certified Unheated – Eye Clean. Incredible Sapphire with amazing colour.